If you have dogs, you’ve experienced dog breath. It just comes with the territory. Thankfully, there are plenty of remedies out there for just this predicament if you know where to look. 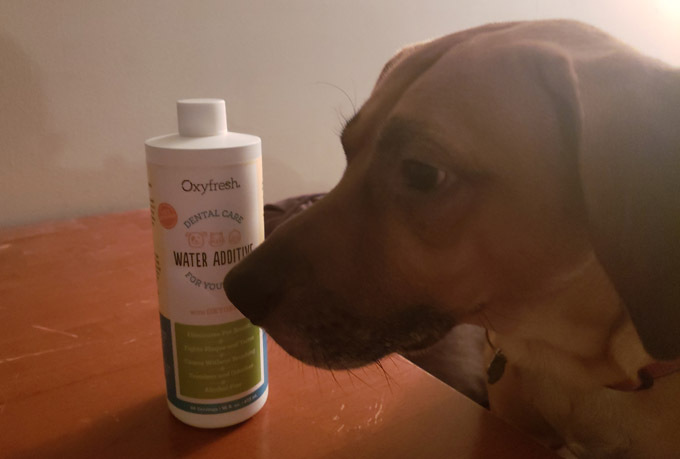 However, recently, we here at DogTime had the opportunity to try a new product from Oxyfresh: a water additive for oral health. 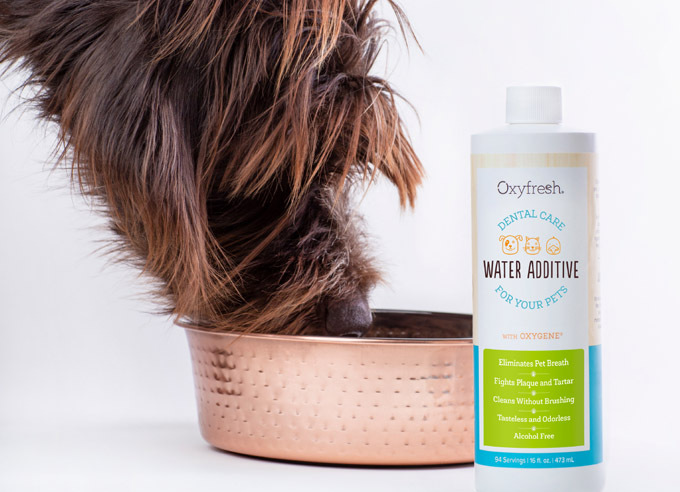 Now to be fair, by “we” I mean “me,” and I am happy to have had this opportunity because Oxyfresh Dental Care Water Additive is currently one of my favorite pet products. Caring for a dog’s teeth can be hard, especially when they’re not the most participatory in their own care. Basically, if the solution doesn’t come in food form, my Beagle mix Chance isn’t all that interested. Therefore, this being a flavorless and nearly scentless additive was a boon for my intentions in testing the product. I used the Dental Care Water Additive from Oxyfresh for a total of eleven days. The instructions require that for every time you fill your dog’s water bowl, you use a full cap per every liter. This seems simple enough, and in theory, it is, but most dogs don’t get a liter of water per bowl. I measured it myself and a liter of water would be filling my dog’s bowl to the brim, something I never do. If your dog’s bowl is smaller, it may require some math and eyeballing, or possibly some measuring spoons to ensure you don’t add too much. In the end, I made due by only using half a cap and that didn’t seem to deter the progress of the additive. 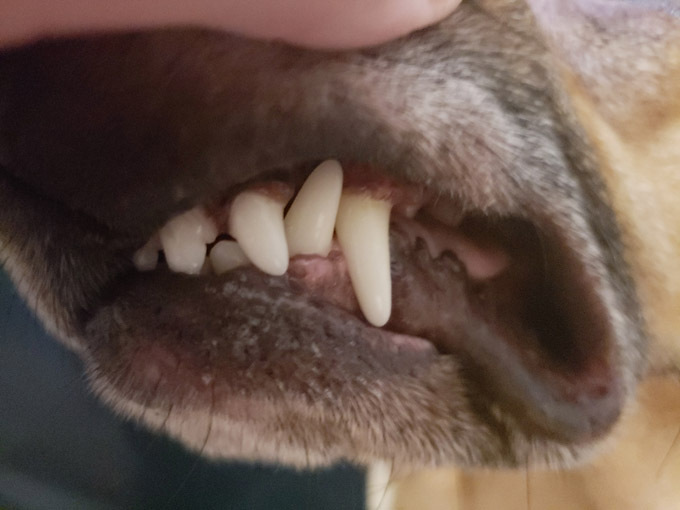 Chance has fortunately always had pretty clean teeth, but as he gets older (and as your dog gets older) oral hygiene will be something that becomes a common part of his care routine. Oxyfresh makes this a far easier endeavor, especially if your pet is problematic like mine. If you have a pet that isn’t a fan of brushing, this will be a big help. In conjunction with his fresher breath, which is it’s own reason to continue with this product, I have since seen a decrease in the plaque on and around his gums. As I mentioned, I’ve only been using this product for eleven days, so to see such measurable progress so soon was, to say the least, encouraging. Furthermore, he never seems to notice the additive. While I do smell a slight odor from the bottle, it’s almost minty in comparison to other things I’ve used for dogs. There are no chemical smells or anything that might cause concern. It is an added bonus that Oxyfresh’s products are cruelty-free and dye-free. Too many unnecessary additives are being added to products for animals these days, and it’s nice to see that some companies are foregoing this. For those who are worried, Oxyfresh’s water additive is also gluten-free, paraben-free, and alcohol-free. It comes recommended by veterinarians with a distinct oxygen-zinc mixture that allows for its scentless and odorless nature. These products are also made in the USA. The water additive works for cats as well as dogs. So if you’re struggling for a method to keep your cat’s teeth clean, Oxyfresh may have you covered in that regard. Let us know if you use or have tried Oxyfresh’s Water Additive, or any other of their products, in the comments below! The writer of this review received no financial compensation from Oxyfresh for any opinions expressed in this article.